Every year, the ONE buildOn Awards celebrate the members of our team who have embodied the best of the buildOn movement in our work to break the cycle of poverty, illiteracy, and low expectations through service and education. Three of the awards highlight team members whose actions demonstrate one of buildOn’s core values of compassion, empowerment, and responsibility, and the Ahmed Khere “Never Give Up” Award recognizes an individual who demonstrates courage and resilience in the face of extreme adversity. 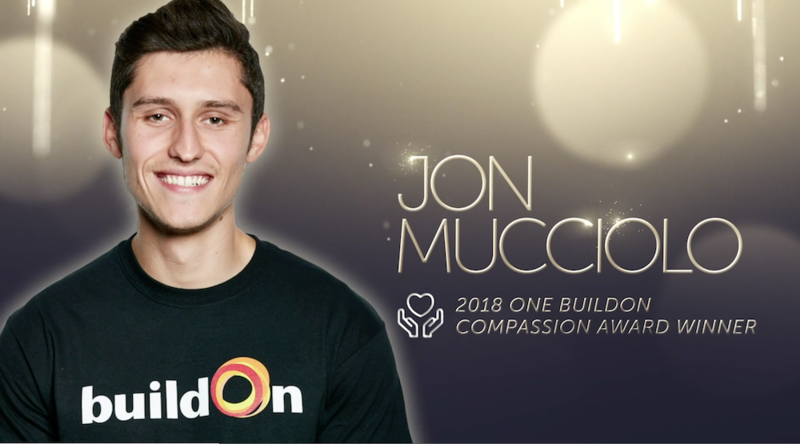 In order to receive buildOn’s Compassion Award, the honoree must have demonstrated humility while alleviating the suffering of others through service, or servant leadership. The buildOn Service Learning Programs that Jon Mucciolo oversees in the Bronx are described as “second families” by buildOn students. And that’s because of Jon’s hard work. Learn more about buildOn in the Bronx here. buildOn’s Empowerment Award is reserved for an individual who has inspired others through leadership and example to create positive change and to believe in their ability to live a bigger life. Adama Doumbia has worked in all three of the countries where buildOn constructs schools in West Africa. Whether in Senegal, Burkina Faso, or Mali, Adama has always emphasized empowering his fellow buildOn team members, as well as members of the local villages during school construction projects. In Mali, Adama has been known for championing the contributions of women on the school construction site and getting children who have dropped out or been denied their right to education to start attending school and learning through buildOn’s Enroll program. Learn more about buildOn schools around the Globe. buildOn’s Responsibility Award honors an individual who has continually stepped up and gone above and beyond in his work to further the mission of buildOn. While a majority of staff at buildOn work in buildOn’s U.S. and Global programming, buildOn has a small Finance and Operations Team working behind the scenes that makes all that we do possible. And one the reasons this small but mighty team of seven people is so effective in their work is buildOn’s Revenue Analyst Neil Ali. Learn more about buildOn Donations. Named in honor of fallen team member Ahmed Khere who sacrificed his life to protect buildOn team members and volunteers during a 2016 terrorist attack in Burkina Faso, the “Never Give Up” Award recognizes a team member who has demonstrated courage, resiliency, grit, and selflessness in the face of extreme adversity. In early 2018, a group of buildOn students from the Bronx were building a school on Trek in the village of San Rafael Apantillo, Nicaragua, when the village experienced especially heavy rains. Those rains caused a nearby stream to swell into fast-moving river. In order to evacuate the students from the village, the group had to cross the river on foot. After attaching a cable to each side of the river that students could harness onto, Yasser Lanuza volunteered to test the cable and make sure it was safe for the students to use to cross the river. After successfully crossing the river, Yasser continued to cross the river to shepherd each and every student across on the cable. “He crossed every person to the other side of the river, and he never gave up,” says Rafael Gonzales, a Field Coordinator in Nicaragua for buildOn. Learn more about buildOn in Nicaragua.